Our device family KSS (compact protection system): HPS protection devices monitor voltage, currents and frequencies of the grid and generator and reliably protect against off-limit of values. For the protection functions the current standards BDEW and VDE4105 are considered. Our protection technology is used in plants, that are controlled by a PLC (programmable logic controller). The KSS takes over the frequency- and voltage regulation as well as active power - and power factor regulation of the generator. A large number of parameters are available to adjust the regulation optimally to the regarding operating condition. With the integrated synchronising function the synchronisation of grid- and generator voltage is taken over. 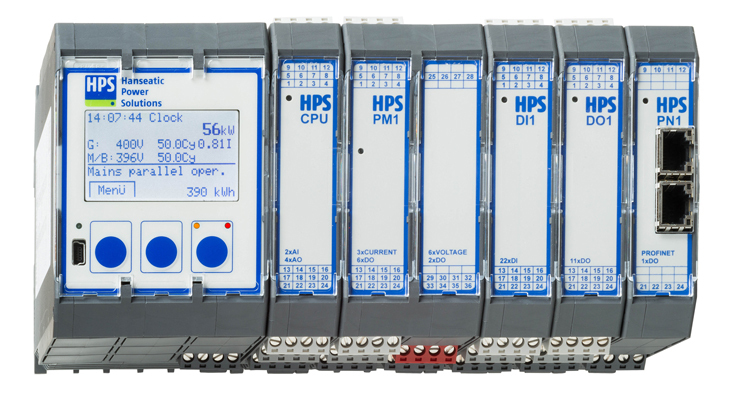 All values available in the KSS can be sent to the PLC by a profibus- or profinet interface. HPS protection devices combine a variety of components, which otherwise would have to be installed seperately. This safes space, time and money. Due to the modular design an extension is possible at any time and is trouble-free.